Click on an event title to go to registration. The Read to Your Deaf Keiki (RTYDK) program sends trained Deaf adults into the homes of families to teach them how to read books aloud in ASL. With families spanning Oahu and on the Big Island, this program is already in full swing! If you are a parent of a deaf or hard of hearing child, please visit our page to see how you can receive this invaluable service! Or you can contact us for more information at info@csc-hawaii.org. 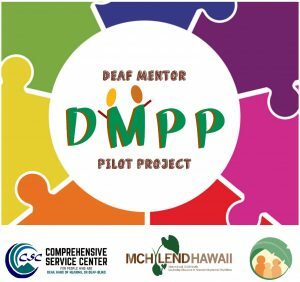 The Deaf Mentor Pilot Project (DMPP) has been established to provide ASL instructional services, consultation, mentorship, and advocacy as appropriate and based on the individual needs of children birth to 3 years old and families who have been authorized to receive these services by the DOH-EIS.